Roper Pond was constructed in 2004 as a naturalized on-line stormwater treatment facility and was built to mimic a riverine marsh ecosystem. The site consists of a large open water area with an emergent vegetation fringe and surrounding upland deciduous forests along the southwest and southeast perimeter of the wetland. There are also many naturalization planting beds located around the wetland that provide additional wildlife habitat. Roper Pond is connected to riparian areas of Mill Creek that form a relatively continuous corridor southward. The Mill Creek riparian corridor also extends northward to the North Saskatchewan River; however, portions of the creek are culverted causing interruptions in the corridor. The diversity of habitats located at Roper Pond and the site’s location within the Mill Creek riparian corridor offer an excellent opportunity to view a multitude of wildlife species including waterfowl and other bird species, various mammal species, amphibians and insects. Parking available off Roper Rd. at Soccer Centre. Extensive perimeter trails varying from multi-use to granular. Roper Pond is located at 7004 McIntyre Road N.W. and has many trails of varying type within and around the facility. 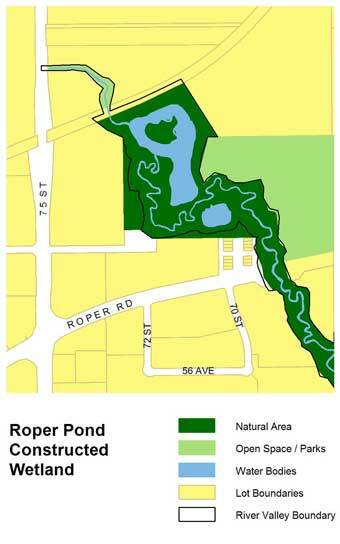 Parking is available directly east of the Roper Pond wetland at the Edmonton Soccer Centre South parking lot which can be accessed from Roper Road. The main trail system can be accessed from the north side of Roper Road east of 70 Street as well as around the sports fields located at the northwest end of the parking lot. Roper Pond provides many different habitat types with a wide range of plant species. Wildlife species at this site are equally varied and numerous. 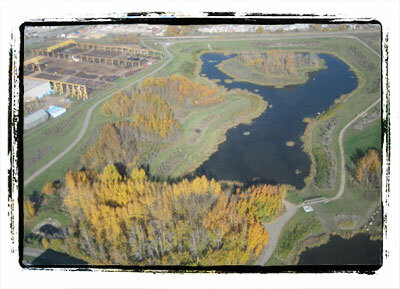 The open water portion of the facility provides waterfowl habitat for nesting, feeding, resting, and raising young. The upland-wetland complex provides space for many other bird species that occur either seasonally or as year-round residents, and mammals of all sizes frequent this area as resident or transient species. Several amphibian species occur at Roper Pond as well as many types of insect. Bring your binoculars and keep your eyes and ears open! Mill Creek Roper Pond Stormwater Management Pond Environmental Impact Assessment (Spencer 2002). Preliminary and Detailed Natural Site Assessment for SE 5090 in Relation to Mill Creek-Roper Road SWM Pond and Roper Pond/Mill Creek Crossing (Spencer 2002). Natural Area Management Plan for ESA SE 5090 (Mill Creek Reach) (Spencer 2005).